My car is cranking but not starting. I don't hear the fuel pump coming on. The relay is clicking when the ignition is turned on, but there is no power going to the fuel pump. The only quick fix I can think of is to check the inertia switch on the left side of your truck. It is a switched designed to shut off the fuel pump in the event of a crash. As they get older, they will sometimes trip on potholes and the like. If that is not it, the wiring will need to be inspected. 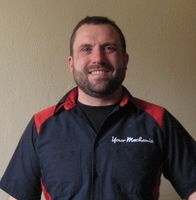 A qualified mechanic from YourMechanic can come out and diagnose your fuel pump’s loss of power and get your car safely on the road.